Normal size and PLUS SIZE available. -If you are unsatisfied,please return it within 30 days after receiving it,and products must be unworn and in the original condtion even after tried on for fit and size. For accurate measurements(Bust-Waist-Hips,Hollow to Floor,Shoes Height),please kindly refer to our Size Chart Picture. 6.The height of your high heel shoes: _____inch or ___ cm. -Tailoring about 10 days,by standard shipping,it usually takes 5-7 days;by EMS,it usually takes 3-5 days.So in urgent occasions,please choose EMS and then contact us the date when you need it.We will arrange your order first and ship it out ASAP. -This item is flat packed when post please iron under warm and low temperature to ease the crease. If you have any other questions,feel free to email us.Thanks you! 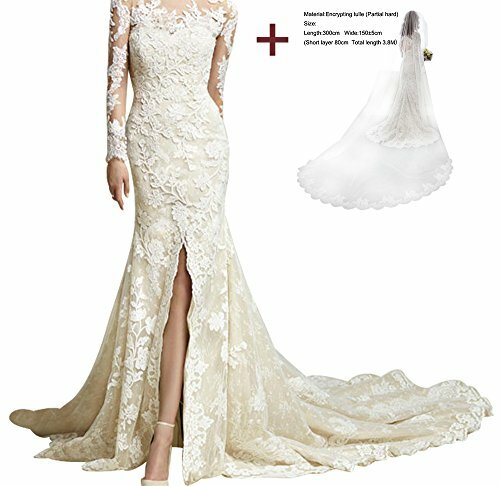 Features:lace/appliques/mermaid/long sleeves/sweetheart/floor length with sweep/zipper and buttons back.Suit for wedding dresses bridal dresses. Plus size also available.Please ignore "Amazon Size Chart",and choose from our "Size Chart"on the left picture. Custom:If you are not sure which size you fit.You can offer your correct measurements about Bust-Waist-Hips,Hollow To Floor(Without Heels),Shoes Height to us via email by choosing"Custom". Note:If urgent, please leave a message to tell us your wear date, we will offer rush service.